On Wednesday, I was feeling frustrated. Sad. Alone. I went to the computer and opened my blog to write. When I looked at the drafts page, there was one that I had never published entitled "Admitting the Truth." I opened it. Read it. Wrote a quick intro and hit publish. I walked away and went back to my normal night routine. The next day, the battle I was in continued. There I was again asking someone to stand up for my son. Asking someone to do what is right. Asking for compassion. I was having to battle for these things. Believe me, I do not want to constantly be in a battle. Thankfully, I'm not. I choose them for the most part and sometimes the battle chooses me. This particular battle chose me. I won't go into the details of this one. But, I will say, compassion won. Thank God. Later Thursday, I was spent and preparing for a special rehearsal with our contemporary worship band and our traditional Bell choir- Bel Canto. That night we had an amazing rehearsal preparing beautiful arrangements of contemporary worship music. I loved every second and it was very therapeutic for me after the day I had. By Friday I checked back in with my blog post from Wednesday. I was overwhelmed by the responses. I've received so many encouraging comments, emails, texts and messages and Moustapha and I just want to say "thank you" to each and every one of you. Being honest is an important step in life. For us, we're honest about this because we're in this together and we need the love and support of others to make it work. And, we're not ashamed. All of us have 'stuff' we deal with. Some of it privately, and some of it can be more public if it helps others. We feel like this is one of those areas where, if we're honest about our experience, it may help others who are just beginning to question whether or not their child is on the spectrum. I will share more stories about how Bakri was diagnosed, how we came to accept it and how amazing he is doing now in the near future. But, for today we want to simply say THANK YOU! We've continued our Summer theme weeks. Since we left off, we had Tradition and History week (the week of July 4th), Vacation Bible School week, and Family Vacation week. The last two were the hardest. You see, no matter how hard we try not to admit it, we have a child on the autism spectrum. Anytime we break in the routine or do something new, it takes him a while to adjust. Usually after a week he's fine, but activities like VBS that only last for a week or family vacations that last for less than a week are really difficult on him. Yes, him. We have three boys and one daughter. Autism is found in 1 in every 62 children in the US and is more likely in boys. 1 in 42 boys are diagnosed with an Autism Spectrum Disorder. ASD. We're in that statistic. Hard to believe. And, hard to admit. We don't want any of our children labeled, especially negatively. We want them to grow. Be the best they can be. Have a bright future. Be themselves. 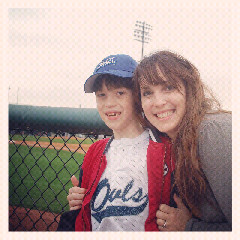 Autism is a scary diagnosis for a parent, not because it is the worst, but because there are so many unknowns. In our case, it was mostly a shock. I grew up around people with special needs. My sister has downs syndrome and she had people who were labeled "autistic" in her classes. They didn't speak. They rocked constantly. There was no way to accurately measure their intelligence. This is not our son. When he was little he communicated well. He never rocked. He looked perfectly normal. He was intelligent. But, slowly we began to notice that things weren't ok. He had difficulty adjusting to new situations. He cried uncontrollably when being forced to leave a park. We could not console him for hours. He resisted making eye contact. He would get "stuck." He became obsessed with topics. He loves vacations and he loves his family. So, off we went to a resort in Texas last week. As much as we knew we would be blessed, we prepared that we may have tough times. It's hard. Our son doesn't look any different. But, he is. We get the "looks," even when It's not that bad. At one point he kept jumping in the pool yelling "Canonball" and jumping straight in. No Canonball. This was the last day after he had mostly adjusted. He was happy. It was a kidfriendly place. But, still, we got looks from others around the pool. Maybe they found his happiness annoying or they thought his parents were too lacking in discipline. On the last day, I noticed another family with a special needs. Nobody seemed to look at them. A child who is more obviously special needs.When people know your situation, or at least think they know your situation, they tend to be more understanding. We left and headed home. He cried. And cried. And, said he didn't want to go home. Adjusting. It's hard. I cried too. He's getting older. Who do we tell? Should we have him labeled at school to get him extra help? Or, will that hold.him back and change who he can be? How can we help him? Is it enough to love him unconditionally? Another Day. Another Field Trip. With four school-age children, it's a wonder I get anything accomplished outside of the Els activities and commitments. Yes, most of these commitments are things I willingly commited to, signed them up for and paid for. Most, not all. There's weekly swim lessons for the three oldest. Leeland will get his turn, but for now there isn't space for all four to take a class at the same time. Little League baseball. This was probably the most fun for the whole family this semester. Our oldest boys played on the same team and they were a really fun team to watch ending the year with a 17-2 record and winning the playoff championship. However, it's a three time a week commitment. Sometimes we had call times an hour after school pickup. That's barely enough time to have a snack and change clothes and leaves no time for homework. Trinity has pre-ballet class once a week. Then, there's cub scouts and weekly church activities. 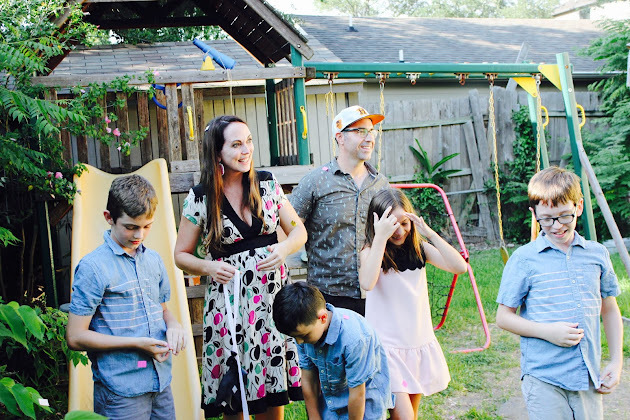 Nearly every week we have at least one birthday party or family event. I'm sure I'm forgetting something, because that's par for the course. I try and try and run around with two calendars, but I still forget things. So, on top of all of that there are class field trips. My "work" is flexible and so, I usually say "yes" to field trips when given the opportunity. 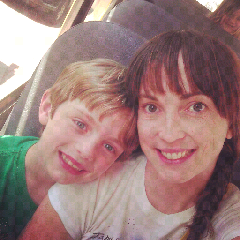 With four kids, there are many many field trips, especially at the end of the year! Yesterday, I went with the first graders to see the play, "James and the Giant Peach." Except for the fact that our buses took wrong turns, missed turns, basically got lost (in my neighborhood!) and took 45 minutes to travel 8 miles, it was a good time. I LOVE my babies and I love their friends and teachers. But, field trips are exhausting. Can I opt for one per kid next year? And, have no guilt? I'll try!